I apologize for the less-than-stellar photo. It was windy, and all those dangly seed heads were dancing merrily with every gust. 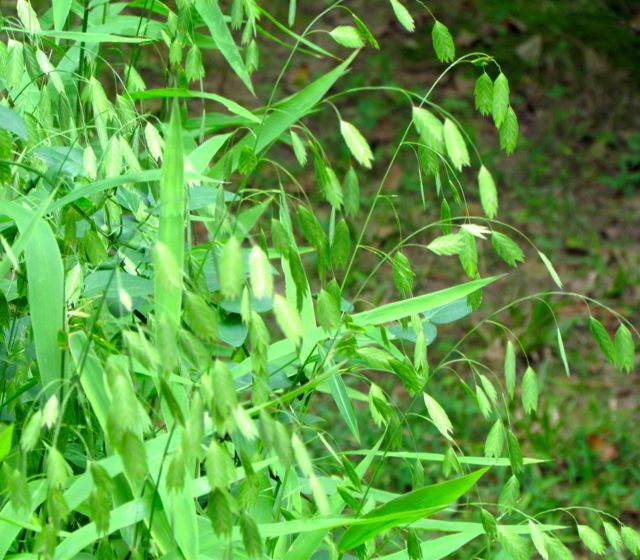 River Oats are a lovely native grass suitable for moist, shady spots in your piedmont garden. Native to the Carolinas and Georgia, it occurs naturally on the banks of rivers and streams, bottomland forests, and other wet spots, especially in fertile soils. It has a number of other common names, including Inland Sea Oats, Indian Wood Oats, Wild Oats, Flathead Oats, and Upland Oats. It looks a lot like a coastal grass famous for stabilizing our sand dunes: Sea Oats (Uniola paniculata). If you’ve visited our southeastern US sand dunes, you’ve likely been told not to pick the Sea Oats, because their roots help prevent sand dunes from moving. When you pick the pretty seed heads for arrangements, you reduce the species’ chances for propagating and thereby stabilizing more dunes. River Oats have no such restrictions. And they are lovely long-lasting additions to dried flower arrangements. They are one of the few native shade-tolerant grasses that grow well in the southeastern piedmont, and they’re also very easy to establish — as long as you give them decent soil and a bit of moisture. River Oats forms clumps. Flower stalks range between 2-4 feet. Mine stay about 2.5 feet tall. I grow mine at the bottom of my north slope garden that is now enclosed by a deer fence. But even before that fence was in place, the deer never even nibbled on this grass. As is true of just about all our native grasses, the deer ignore them. These grasses would be ideal in a rain garden — a low spot in your yard where water collects after rains. That extra bit of moisture is all they need — as long as they’re also in the shade. Because they’re clumpers, they mix well with other moisture-loving native flowers, such as Swamp Milkweed. River Oats also work as part of potted plant arrangements — as long as they are sited on a shady porch and adequately watered. If you don’t cut the mature seed stalks for flower arrangements, they will morph from summer ivory to an autumnal soft brown, eventually weathering to a silvery gray by late winter. By then, most of the seeds will have been devoured by small mammals and grain-loving birds. The leaves are a food source for several species of native skipper butterflies. I planted three pots of River Oats around a large boulder at the bottom of my hill over 20 years ago. Very gradually, the clumps have grown, and just a few seeds missed by animals have created new plants. The boulder now has a soft and lovely green skirt of River Oats, topped much of the year by dancing dangling seed heads. I highly recommend this native grass to all piedmont gardeners, especially to those with shady damp spots in their yards. 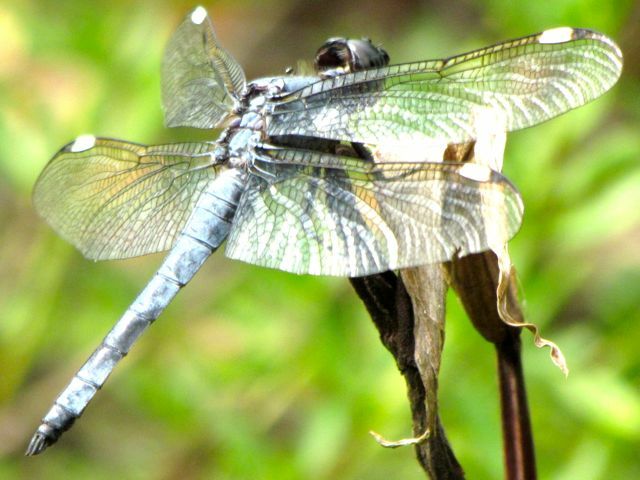 And while I’m writing of wet spots, I must share this recent photo of one of the many dragonflies that patrol the numerous wet areas in my yard. This one was lingering around the front water feature. We think we’ve even identified it, but if I’ve got it wrong, I hope an Odonata expert will set me right. This entry was posted on July 23, 2014, 3:36 pm and is filed under Favorite Plants, Native Wildlife, piedmont gardening. You can follow any responses to this entry through RSS 2.0. You can skip to the end and leave a response. Pinging is currently not allowed. Catherine, in my garden Chasmanthium latifolium seeds all over and is a menace. I have been trying to get rid of it for the past five years so I would have to provide a caveat that it can be invasive. I love the flower heads, love the grass–but have concluded it’s not worth the constant weeding. Color me surprised to hear about your problems with aggressive River Oats. I’ve never heard the folks at the NC Botanical Garden mention any aggressive tendencies with this plant, nor is it mentioned in the literature I consulted. You must provide absolutely perfect habitat for it. Is it possible that you have fewer critters stopping by to munch on the seeds? As I wrote, the seed heads on mine always seem to disappear by late summer, clearly eaten by something. I still think this native grass would be a good candidate for a shady rain garden, which likely will not be in a part of the landscape that will be routinely scrutinized. It’s always great to hear from you, Kit. Thanks for stopping by! In my yard, it has seeded everywhere. Plus, it’s deep-rooted, so is hard to pull out. With my fenced-in yard, I probably don’t have anything eating it but even my deer left it alone. I have tons of birds, but they ignored it. My seed heads never disappeared. I wish I could grow it but for me it hasn’t been worth the trouble. Love your blog, keep it up! I’m sorry they didn’t work out for you, Kit. I suspect that my much less tamed landscape harbors more mice and other rodents that find the seeds tasty. I’m glad you’re still enjoying my blog. Thanks again for stopping by! I have had the same experience as other posters — rampant self-seeding. They’re a beautiful grass, but after quite a bit of work, I’ve reduced them to one clump at a corner that thrives on moisture from a downspout — and I cut off the seedheads once the plant turns its beautiful tawny color in fall. I regret depriving animals of the seeds, and depriving us of the great look of the trembling seedheads against snow, but I just don’t have the extra time to root out the amazing number of seedlings in spring and summer. They’d be fantastic for a naturalized area. I’m in zone 6b in the western foothills of the Blue Ridge in Virginia. Welcome, Nell. Thanks for sharing your experience with this lovely native. I’m glad you’ve devised a way to live with it while still controlling its tendency to spread.